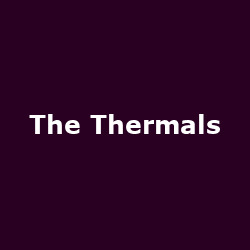 Hot on the heels of their recent support slot with Wakefield's The Cribs, Portland, Oregon's The Thermals head out in their own rite starting next week, and release latest single 'We Were Sick' taken from fourth studio album 'Now We Can See'. We were sick! We sat atop the world with limitless power and control. The only problem was our greed grew exponentially. The more we had, the more we needed. We didn't enjoy a second of our fame and wealth. It only made us more paranoid and detached. The masses loved us, we feared and hated them. We nurtured our disease, cared for it like a sick baby bird in a dirty shoe box - fed it all kinds of expensive medicine, always making sure to under dose. You want to treat, not cure, in a situation like this. Kill the sickness and everything else goes with it. In the end, the virus was all we had, all we cared about. It kept us well. Hell, it kept us alive! When it's all over, we'll have "We Were Sick" to explain ourselves to the archaeologists. We were high, we were alive, we were sick. They head-out on their UK/ Ireland tour starting next week at Bristol's Thekla on 14th June, then onto Leeds, Edinburgh, Glasgow, Belfast, Dublin, Manchester, Birmingham, London and finally Brighton on 24th June. Tickets for the tour range from £8 to £10.50 (+ booking) for the London date and are on sale now.